The Ewha Music Research Institute (EMRI) is consistently gaining recognition as a hub for the study of East Asian music, namely that of China, Japan, and Korea, as it continues to embark on new collaborative research projects and organizes pertinent conferences focusing on important issues of documenting and digitizing primary sources in East Asian music. The Ewha College of Music, as the first music education institute in Korea, has led the field of Western music education and performance since its establishment in 1925. And, since its establishment in 1997, the EMRI has been diligently creating inner-connective environments in which the three important field of music (education, performance and research) are integrated through interdisciplinary approaches. Thus, it has become a leading music research institute within and beyond East Asia with prominent international accomplishments. Since 2011, the EMRI has been engaged in a significant research project, “Establishing a Database for East Asian Music of the Modern Era 近代,” funded by the National Research Foundation of Korea. This is particularly noteworthy because prior to this, there was no modern East Asian music database available for research. 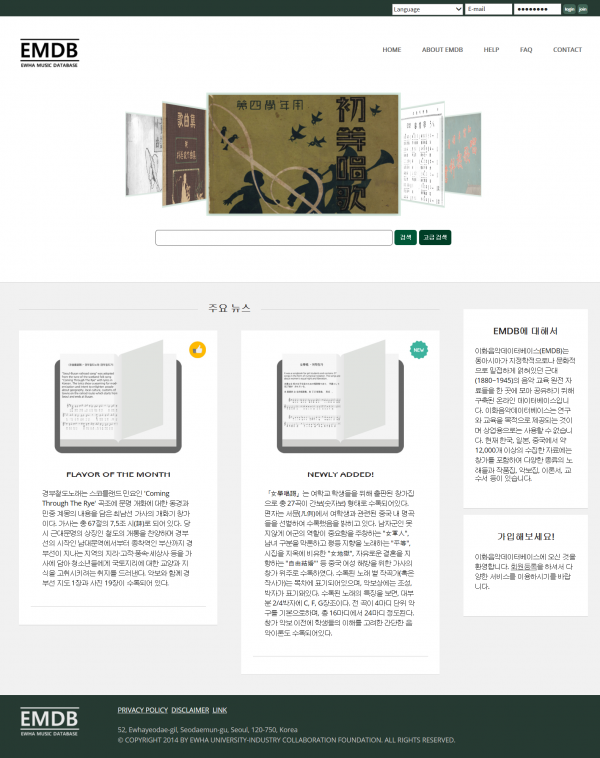 Now with Ewha’s database (EMDB) providing access to primary sources of East Asian modern music in one place, research on East Asian music is becoming tremendously invigorated. During the first phase of the database project from 2011 to 2014, two critical international conferences were organized by the EMRI, which proved to be an important impetus for understanding and developing the new database system. The first took place in October 2012, with participating scholars of East Asian modern music from various institutions within the region. The theme of the conference was “Modernity in East Asian Music: The West, Tradition, and Beyond;” it was intended to advance the intellectual practice of identifying the ‘locus of utterance’ of Asian musicologists and to catalyze the formation of a new horizon in intellectual discourse that could lead to inter-referential solidarity. It was an important meeting, since it rejuvenated the discussion on modernity of East Asian music that had become stagnant, and more significantly it provided an underlying reason for establishing a database for East Asian music in its socio-cultural context. As a result, there has been an increased interest in East Asian music within and beyond the region, and it is not too much to state that the first conference was responsible for creating a close network among scholars in the region. A second conference was organized by the EMRI in November 2013 with invited specialists in music database archive and documentation practices from East Asia and the West. The topic of the conference was “Keeping Music Alive: Innovative Approaches to Music Documentation and Interpretation.” It dealt with the practical as well as philosophical issues of collecting and digitizing primary sources of modern East Asian music. The three-day conference focused on technical aspects, which was certainly new to Asia, and two highly complementary, but often ignored aspects of music research were placed together. On the one hand, international institutions and libraries, including RISM [Répertoire International des Sources Musicales], RILM [Répertoire International de Littérature Musicale] and IAML [International Association of Music Libraries, Archives and Documentation Centres] with experience in documenting a vast array of music sources shared many years of their technological advancements, the philosophical thinking behind those changes, what they have documented, and how that knowledge can be practically applied to music research. On the other hand, scholars using those sources discussed what types of research are being carried out, how the recent online databases have influenced their research, and what we anticipate in our future research. These conferences have greatly influenced the formation of the EMDB, for example by taking into consideration the concerns and constructive criticism of scholars who want to place Asia at the center of the discussion. Likewise, these meetings stimulated further discussions and exchanges among researchers and librarians/archivists, and indeed have filled a huge gap between the East and the West. With the above-mentioned efforts by the institution, EMRI is steadily gaining recognition as the mecca for East Asian Music research. As a result, EMRI was honored as a new member of the International Working Group of RISM, becoming one of 35 participating institutions. RISM is a multinational non-profit venture that aims at the comprehensive documentation of extant musical sources worldwide. The organization, founded in Paris in 1952, is the largest and only global operation that documents written music sources. In June 2012, the director of EMRI, Professor Hyun Kyung Chae was invited to give a talk at an international conference celebrating the 60th Anniversary of RISM. 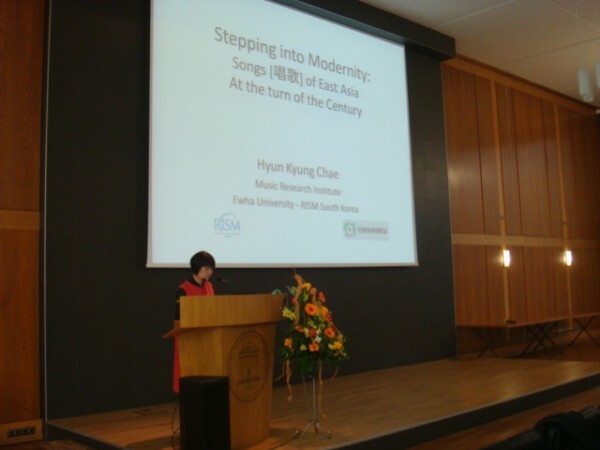 She presented a paper entitled, “Stepping into Modernity: Songs of East Asia at the Turn of the Century,” in Mainz, Germany. Taking one example of a shared song repertoires in East Asia that originated from Germany, the presenter emphasized the importance of collaborative work among scholars within and beyond East Asia. The initial EMDB project was completed as of November 1, 2014, and the database’s web site, eMUSICdb.info opened to the public. It has become a useful tool for researchers to understand an overview of modern East Asian music. Although still in its preliminary stage, it allows users to draw a comprehensive as well as comparative picture of how Western music entered the region and how it was transmitted during the modern era. An understanding of the process of design and implementation of the EMDB system was published in the paper, “Challenges to Music Documentation: Design and Implementation of a Web-Based Content Management System for East Asian Music Education Document” by Hyun Kyung Chae, et al., in Fontes Artis Musicae, Vol. 61, No. 3 in September, 2014. Through continuing dialogue with scholars world wide, the EMRI has also become a national branch of the IAML and Director/Professor Chae became the president of the Korea Branch in December 2014. 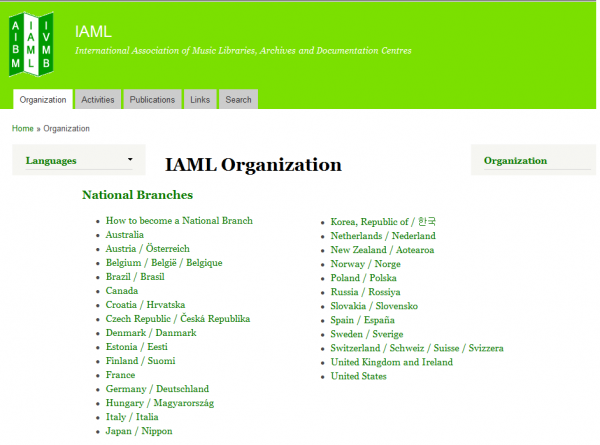 The purpose of the IAML is to encourage and promote the activities of music libraries, archives, and documentation centers in order to support and facilitate the realization of projects in music bibliography, music documentation, and music library and information science at national and international levels. 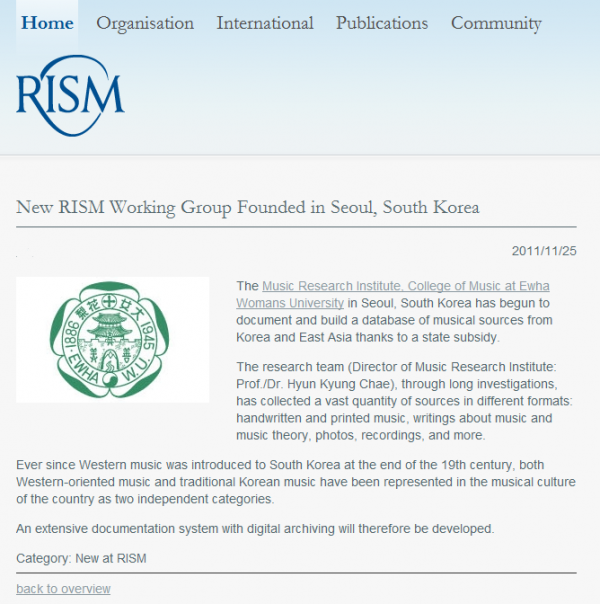 Upon completing the first database project on modern East Asian music in November 2014, the EMRI received another significant research grant funded by the National Research Foundation of Korea in December 2014. The project is called, “Creating Innovative Music Culture Contents through Collaboration and Individualization.” First, we will expand the existent EMDB, which focused on documenting the first half of the 20th Century, by collecting primary music sources from the second part of the 20th Century. Additionally, we will study innovative methods to provide individualized music culture contents to users and eventually revitalize the field of music education, composition, and performance of East Asian music in the new digital era. The project is the first attempt in the field of music to create individualized music culture contents through collaboration between the users and content providers in the oft-called 3.0 semantic web system. The project’s key to success will be the interdisciplinary communication between the teams of researchers from musicology (including music education and performance), digital humanity, library science, computer engineering and copyright/privacy law. This collaborative research project will provide a turning point in creating a music culture that expects to play a leading role in music contents creation worldwide. As the integral part of this research project is the collaboration between the users and the content providers, it is expected that the project will pave a new road for communication and interaction among music scholars as well as music lovers and amateur musicians. The EMRI will undoubtedly be an unparalleled institute with excellent skills, technology, and expertise in creating this new music culture. About Director/Professor Hyun Kyung Chae (hkchae@ewha.ac.kr): After graduating from Ewha, Professor Chae received her M.A. in musicology from Harvard University, and Ph.D. from the University of Michigan. Upon her return to her homeland, Professor Chae taught and served as the Dean of the Music School at the University of Ulsan. In 2000, she reestablished herself at her Alma Mater, where she has been teaching music history and musicology as a full professor as well as serving as the Director of the Ewha Music Research Institute [EMRI] since 2011. Under her direction as the director, the EMRI has become the center for East Asian music research worldwide, especially in the field of music database and the documenting of primary sources of the 20th century. Since its reception of Western music, Korean music education has been centered primarily on performance, therefore gaining world recognition as a reputable research center for East Asian music is a gigantic step for the EMRI as well as the music field in general. Director Chae’s endeavors have led to the reception of two substantial research grants from the government, which in turn has generated much needed discussions on modern East Asian music. The first grant from 2011 to 2014 was entitled “Establishing a Database for Modern East Asian Music” while the second from 2014 to 2017 is on “Creating Innovative Music Culture Contents through Collaboration and Individualization.” Both have certainly had a great impact and heightened the academic reputation of Ewha. In fact, one of the methods of documenting and searching music materials discovered from the first project, called “Music Search Method Based on Music Incipit“ has been recently patented. Director Chae also initiated and organized several formal as well as informal international conferences and dialogues among scholars and archivists in the region as well as Europe; as a result of those close-working relationships, the EMRI became one of the select international working groups of RISM in 2011. Director Chae also became the President of the Korea Branch of the IAML in 2014. In addition to her recent work on creating a music database and archives, her major research interests have been feminism and colonialism, gender studies, and women musicians throughout music history, especially under-represented women composers/musicians of Asia during the modern era [近代]. Her research on one of the first generation of women composers of Korea, Kim Soon-ae (1920~2007), resulted in a paper entitled “Kim Soon-Ae’s Kagok [Art Song]: Searching for Originality,” which was published in Music and Culture Vol. 17/2, 2007. Her recent studies have included the world-renown Korean-born female composer Youngi Pagh-Paan [1947~ ], whose chamber opera, Mondschatten, was analyzed for the paper “Between, Betwixt, and Beyond: Finding Younghi Pagh-Paan in Mondschatten (2006),” which was originally published in the Ewha Music Journal, Vol. 15/2, 2011, and has now been revised in English to be included in the archive of Paul Sacher Stiftung in Basel, Switzerland.